Take care of your business’ plumbing needs with help from our team. 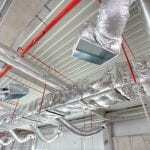 Plumbing issues can result in disastrous results for any commercial location. Even something as simple as a clogged pipe or a small leak can slow down your operations or even close your business, which can have an undesirable impact on your customers, workers, and profits. We understand that when it comes to your business in Raleigh, North Carolina, slowing down isn’t an option! At Carolina Plumbing & Repair, we provide quality commercial plumbing services that will get your location up and running again in no time. We’re even available 24/7, so you always have someone to call in the event of a plumbing emergency. Every member of our team is thoroughly trained to accurately assess situations and respond effectively in a way that treats the source of the problem and not just the symptoms. We also use advanced technology to ensure you get the most accurate, efficient, and excellent commercial plumbing services from us. From offices and hotels to schools and grocery stores, we serve all types and sizes of commercial locations in Raleigh. Wherever and whenever you need commercial plumbing services, we possess the right equipment and training to provide the plumbing services you need. The next time you need a commercial plumbing professional, don’t hesitate to reach out to our highly trained, skilled, and professional team. At CPR, help with your business’ plumbing system is always a quick phone call away, so contact us today!